Which bot should I level up next? 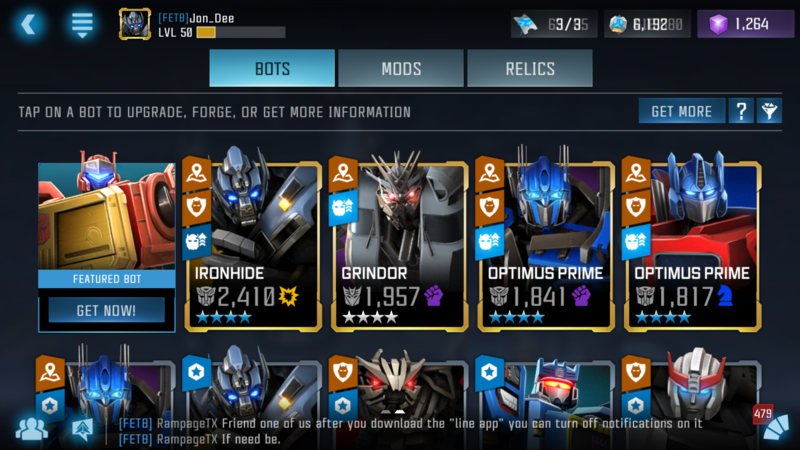 4* Grindor (duped), 4* OG Optimus (unduped), or 4* MV Optimus (unduped)? just enjoy the game the way you want to, but I bet most people will say CW prime. It all depends on what you need them to do. If a general all around bot, then both OG and MV Optimus are great choices. If you are looking for a raid team member OG Prime is great. If you have a Ratchet to pair with then OG Prime is great. Both Primes have some synergy with your IH. The only use I really see for Grindor currently is as base defense. I love my Grindor, but there’s no reason to upgrade him over MV Prime. I'd suggest MV1 Optimus Prime as your next R4 bot to synergies with your current R4 Ironhide. 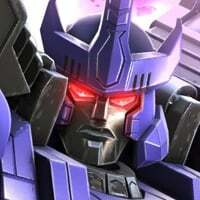 A 4-Star Ironhide provides MV1 Optimus Prime a 70% chance to apply an additional bleed stack which could prove really useful in ending the battle a bit quicker and ensuring longer survivability. MV1 will prove most useful in raids as well against Harm Accelerators that is present in almost every player's base. Especially at your commander level. When you go up higher and higher in terms of your medal count. He will be your saving grace against the higher level bases you will inevitably face. I just recently duplicated my now signature 5 4-Star R4 MV1 at Forge level 100 and I can tell you from experience. He saved me 100% of the time in raids and in mission battles. And 98% of the time I've had him and used him. He was not duplicated. He never failed me once no matter the difficulty. I pin him against demolition Megatron with Robot Resource, Laser Guidance, Exo-Filters on him and even when my opponent uses a SP3. My MV1 tanked all the damage and still able to win the battle for me. He's a well-rounded character for anything, in any game mode. And no one cares about which bot you upgrade! Some people did obviously care, in case you can't read. Hey, you just like making random, not helpful polls. Just try making forums, clean can you? Just a waist of a thread. Edit: Upgrade MV1 because you have more synergies with him. Grindor is far from bad...he is a tank and a power house. Yes he moves slower and is a little sluggish BUT once you master his style you will be eating those words. His sig makes him even better with that huge melee buff. In comparison though OGP out ranks MV1 and Grindor IMO. I only find grindor good as a defender on harm accelerator or exo-filter. I would only level him up when the bots he uses for missions, AM, Raids etc are leveled up. And you can always count on MV1 to win a battle for you. He is a consistant fighter, not defender.